As today was dry and sunny we decided to devote the day to outdoor aspects of Dunedin. There are museums and many other things to occupy rainy days. Our motel was only a mile from the Botanic Garden and having missed the one in Christchurch, we decided to head there first. They have a large collection of camellias just inside the entrance which reminded me of deciding that I had wanted a white one for our garden. I had searched dozens of specialist camellia nurseries without success and then found one quite incidentally, for only £9.95 on a visit to B&Q for something else. Needless to say, those in the garden here are not in bloom at the moment. The winter garden in the glasshouse had numerous interesting flowers. In addition to various collections of plants and trees, including native species, there are also aviaries containing birds from all over the world. 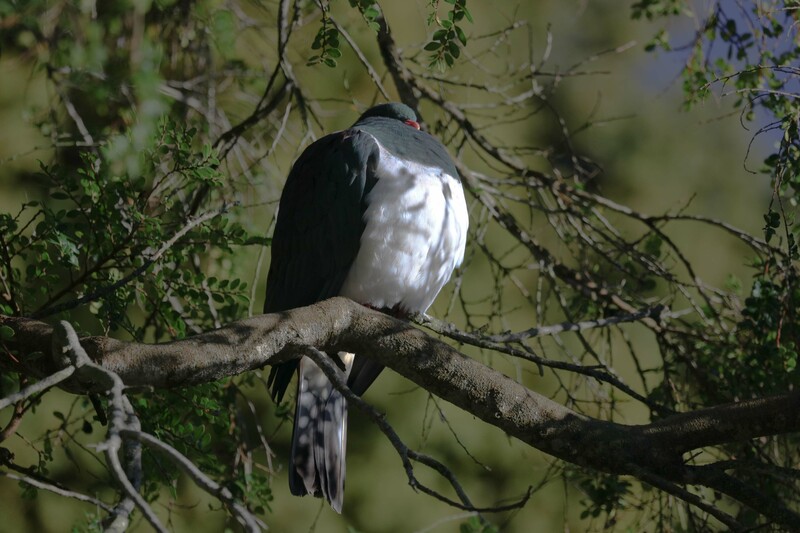 One bird I did see in the garden is the New Zealand Pigeon which is also referred to as a Wood Pigeon. We had a coffee in the cafe here where service was amazingly slow despite there being several staff on duty. It was getting busier as today was a public holiday for the Queen’s birthday, something we do not have in the UK so it was quite bizarre to find out that both Australia and New Zealand have one. 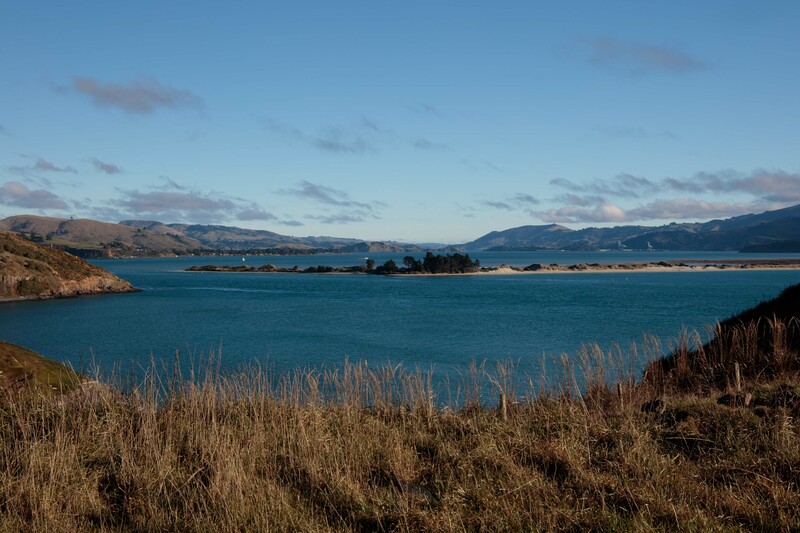 In the afternoon we drove along the northern edge of the Otago Peninsula past several bays and as far as you can go. There is a Royal Albatross Colony here and you can visit the centre. 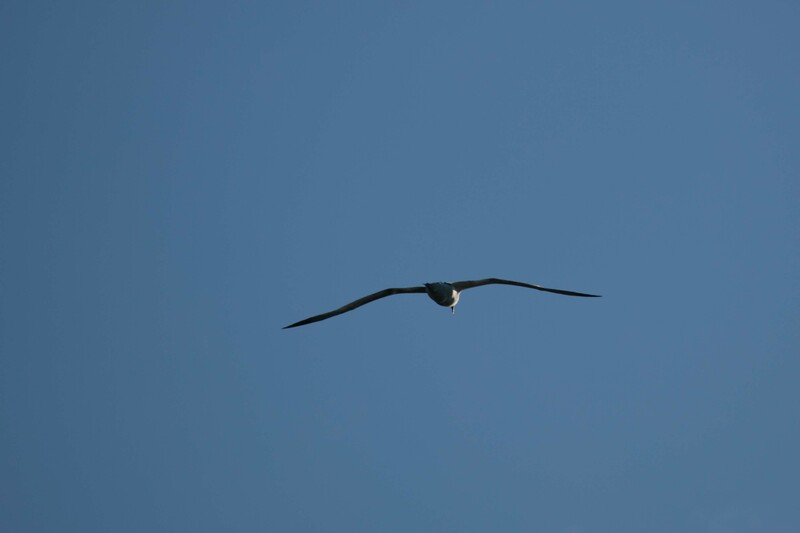 A few flew overhead as we were on one of the cliff overlooks. One of the main reasons for coming out here was to visit Penguin Place. 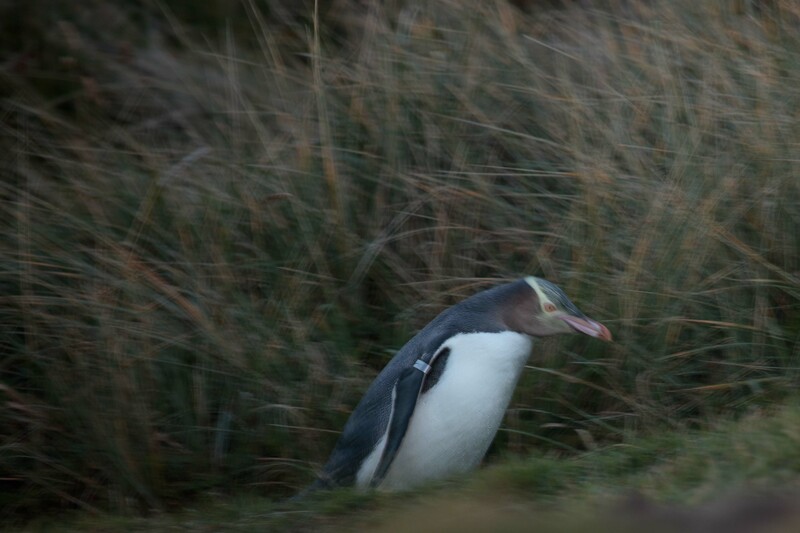 This is a private conservation reserve for the endangered Yellow-Eyed Penguin. A farming family started it and all the ticket money raised from tourists who visit for a tour and viewing goes to support the reserve and the small penguin hospital where they are rehabilitated and released into the wild again. The reserve also tries to control introduced predators such as feral cats, stoats and weasels who are a threat to the penguins. Their numbers have also declined due to habitat loss and human interference. 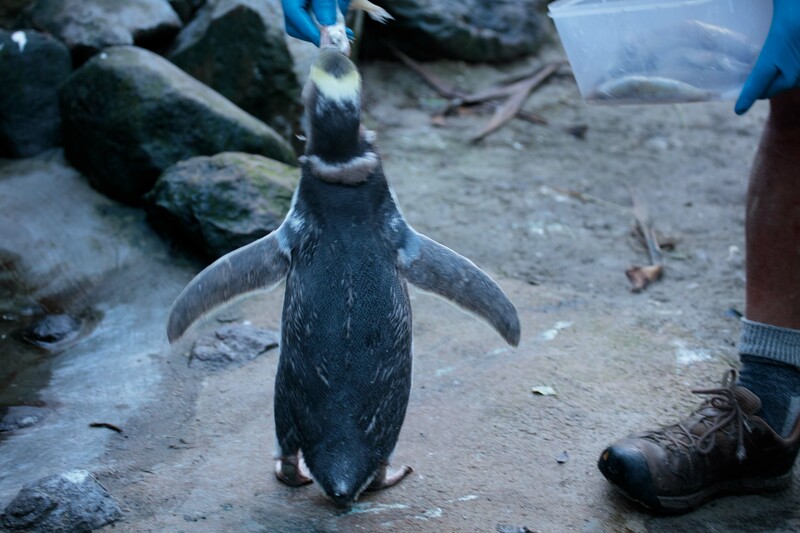 We saw penguins in the hospital – this one with a foot injury is being fed. 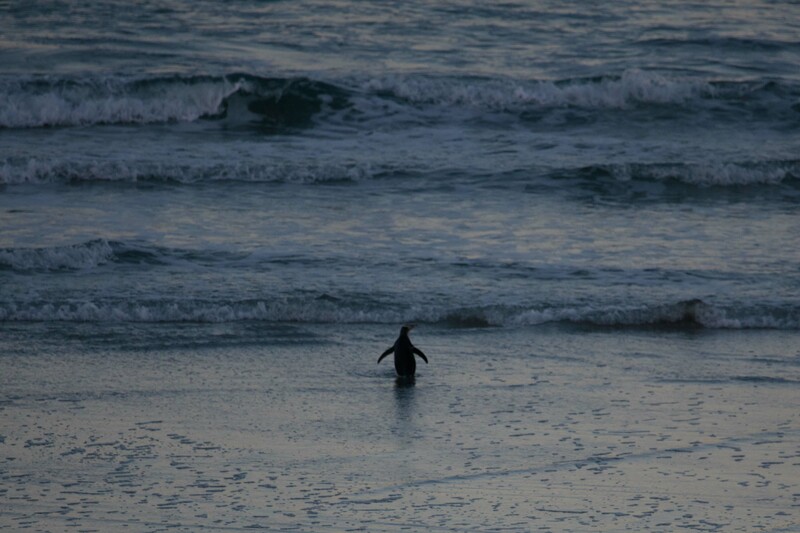 In winter, the only hope of seeing a wild penguin is when they return to land from feeding in the ocean. This usually happens close to sunset. We were bussed part way to the beach and then walked through tunnels designed to hide us from any penguins on land, and down to the hides. 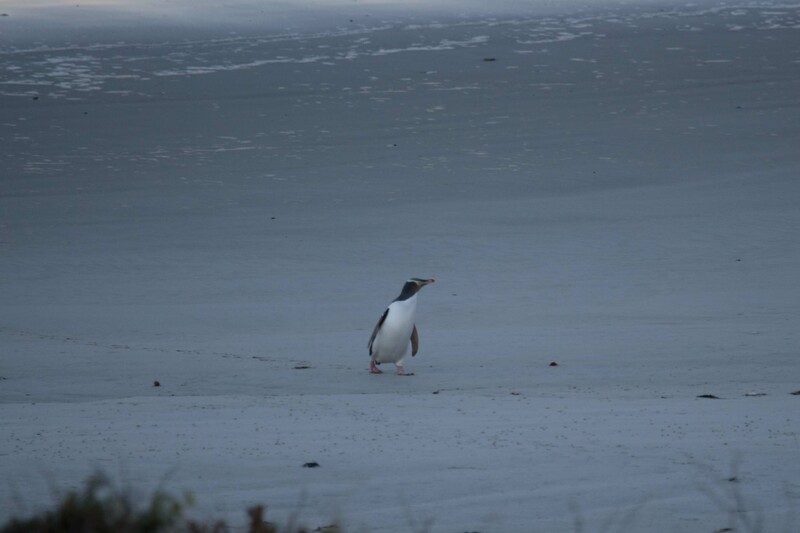 Eventually one penguin did appear and after waiting unsuccessfully for any of his friends, walked across the beach and up the track. Afterwards, we drove back into the city and had our evening meal in an Irish pub just down the road called ‘The Bog’. Service here wasn’t very brisk either. At last, a dry & sunny day! Not sure if you’re familiar with my favorite band, Crowded House. 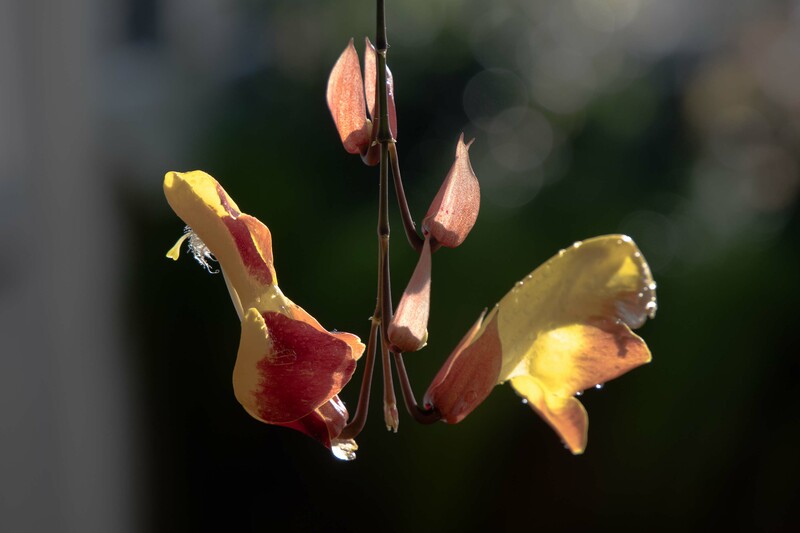 They’re famous for the song written by the New Zealander Neil Finn called “Four Seasons In One Day” about his beloved homeland’s mercurial weather. I must show the penguin photos to Avonlea and let her know about Penguin Place where you visited. She’s an enormous penguin fan. I bet she’ll especially love the photo of the penguin walking into the water.